Distributed in Germany, Norway, Sweden, Denmark, Holland, USA, and Canada, AddMovement is now bringing its innovative, gyro-based wheelchair & unique seating system to the UK and is on the lookout for dealers. The AddSeat was developed in 2010 in Sweden by AddMovement AB. The product’s innovator Marit Sundin – a Paralympic Gold Medallist – was selected as Female Innovator of the Year in Sweden in 2014/15 and the company was chosen by the EU as one of the Top 10 Sustainable Mobility Start-ups in 2018. Emphasising its mission is to provide easier access to all aspects of life so people can be an active part of society, the company says it is repositioning mobility. During spring 2019, the company is launching the product in the UK, with Naidex being its first outing in search of dealers. Consisting of two essential components – the seat and the associated Segway base – the AddSeat creates a unique, powered gyro wheelchair. Additionally, the seating system can also be mounted onto other substructures. Incorporating a range of unique features, including ‘support legs’ providing enhanced safety and a seat glide function for better usability, the company says the AddSeat suits not just those with mobility problems but also those that want an environmentally sound personal means of transport. The device’s support legs can connect to the inner workings of its Segway base, automatically turning off the Segway when deployed, whilst a parking feature provides more stability when transferring between the mobility vehicle. With Segway technology requiring users to move their centre of gravity forwards and backwards to start and stop the device, with the seat’s innovative glide function makes the process intuitive and easy according to the company. Additionally, due to the range of the vehicle, AddMovement says the product reduces users’ dependence on public transport, highlighting this as particularly beneficial to those living in areas where services are limited. 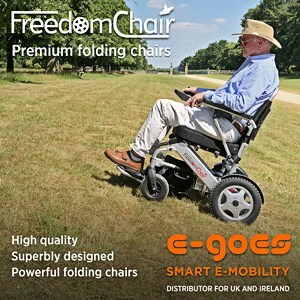 The product’s small footprint makes transporting it easier on public transport and personal vehicles, whilst its AirRide feature provides all-day comfort for users, with the company noting that many users prefer to sit and use the AddSeat for working rather than transferring to a fixed chair. With its unique styling lead by chief designer Ian Thompson, who is ex Maserati and Lotus cars, AddMovement says it will continue to provide an exciting, stylish vehicle for its users.